Build great iOS 12 apps with Swift 5 and Xcode 10. Learn how to go from “the app needs to do this and that” to actual Swift code. Avoid overwhelm. Finding your starting point is difficult, and that’s why we have a course plan that you can follow step-by-step. Work on real-world app projects. Learn how to master the most commonly used frameworks, and expand your development skills. Practice your craft. Learn how to improve your problem-solving skills and gain real-world experience by practicing how to code. Learn what every bit of code is for, and why you code it like that. The course explains why you’re doing what you’re doing, and most iOS tutorials don’t do that. The course is always kept up-to-date with the latest Swift version. You get lifetime updates for free, including Swift, iOS and Xcode. Don't waste time with outdated iOS tutorials! Got stuck with a coding problem? Our support team is here to help you back on your feet in no time. We go the extra mile to help you move forward and learn more. Build your understanding of Swift programming. The course helps you explore new APIs, SDKs and concepts. Work on completing your iOS development skills. As a self-taught coder you can miss out on better approaches, and the course shows you those best practices. Learn how to use popular frameworks like Alamofire and Realm. You need real-world projects to work on, and iOS tutorials don’t give you that. That’s why, in Zero to App Store, we’ve got 6 real-world app projects for you to build. In 2014 he started LearnAppMaking to teach app development and marketing to indie app developers, and to help them create better, more profitable apps. Recommended for: beginner and intermediate-level developers, or developers who want to get up to speed quickly with iOS development. Recommended for: developers who want to publish their own iOS apps in the App Store, and generate revenue with app sales. Recommended for: aspiring iOS developers looking to get hired and build their careers, or those looking to make a career change. Includes all courses from the Developer bundle! When you sign up for the Publisher bundle, you also get immediate access to all courses, source code, templates and materials from the Developer bundle. That's over 25 hours of screencasts! Includes all courses from the Developer and Publisher bundles! When you sign up for the Professional bundle, you also get immediate access to all courses, source code, templates and materials from the Developer and Publisher bundles. That's 25+ hours of screencasts! Learn the basics of iOS development: variables, functions, classes and objects. It's a great step-by-step way to start learning how to code iOS apps. You'll learn how to use Xcode, Interface Builder and Auto Layout, and how to create apps with UI elements like buttons, table views and web views. Design first, then code! In this course you'll learn about app design, how to make mockups, and how to rebuild a graphic design in Interface Builder. Build the coffeeshop app Places, that shows you coffee places nearby. Learn about intermediate iOS development topics, like closures and multi-threading. In this course you'll connect your app to a web-based JSON webservice, make web requests with Alamofire, and track user behavior with Google Analytics. Let's get started! Every app is connected to the cloud these days. In this course you'll learn how to use the cloud-based Parse Server back-end in your apps. Learn how to build a complex social media app from scratch. You'll connect it to a cloud-backend, incorporate follow-unfollow functionality, and create a timeline of posts. In this course you'll learn how to publish your app in the iOS App Store. Learn about provisioning profiles, beta testing with TestFlight, and configuring iTunes Connect. Learn how to set up your own Parse Server in the cloud, and use it as the back-end for your apps. Learn about ideation, validation, design, development and marketing and what they mean for your app project. Let's build a chat app! 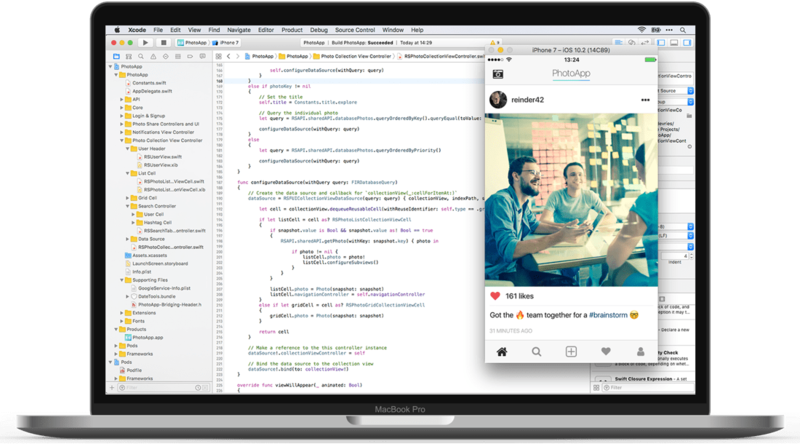 In this course, you're going to build a chat app for iOS with Xcode, Swift and Firebase. App architecture is important to understand as a practical iOS developer. But where do you start? In this course you'll learn beginner Swift development, including topics like variables, functions, operators and optionals. In this course you'll learn intermediate Swift development, including topics like collections, loops, closures and Object-Oriented Programming. In this course you'll learn advanced Swift development, including topics like casting, generics, tuples, delegation and error handling. Great app ideas aren't unique. Surprising? In this course you'll learn how to come up with great app ideas – a crucial aspect of indie app business. What's your app's target audience and how can you reach those people? With this course you'll answer those crucial questions for yourself. In this course you'll learn how to pitch your app, how to pick the right business model, and how to make money in the App Store. You need an app landing page, period. Here's how you build one. Content marketing is a new way for app marketers to reach their target audience. Great content naturally attracts users. Here's how. You get more organic app installs with App Store Optimization. Learn how to find keywords, optimize them, and improve your rankings. As a professional iOS developer, your app showcase represents your work. But how do you get started building a portfolio? This course shows you how. How do you get hired as an iOS developer? This course shows you how to find clients and employers, how to ace the application process, and how to gain real-world experience. Coming soon! How do you go beyond your best work? In this course you'll learn how to use your work to make an impact, how to create value for your clients, and how to set yourself up for a successful career in iOS development. Coming soon! and he put tons of love and experience into his courses. As an alternative to the FAQ, here's the YesAQ. Can I get a refund within 30 days of signing up? Can I upgrade my course bundle after signing up? Do I get free updates for upcoming Swift, iOS and Xcode versions? Do I get helpful support through the tech learning curve? Can I sign up if I don't have any coding experience? Do I get access to the courses immediately after signing up? Do the courses include both video screencasts and complete text guides? Do I get help when I'm stuck coding my app? Are the courses up-to-date with Swift 5, Xcode 10 and iOS 12? Do the courses teach best practices and fundamental topics? Are the courses kept up-to-date with new Xcode, Swift and iOS versions? Do you recommend these courses for beginner developers? Are the courses suitable for intermediate level developers too? Should I learn Swift instead of Objective-C? Can I use the app templates from the courses in my own apps? Can I watch the courses on my iPhone, iPad or desktop? Can I ask more questions to support@learnappmaking.com?